The English word 'Bank' came from the Italian word 'Bancab / Monte', French word ' Banque' & Garman word 'Banke' those mean bench or long tool or money transactions table. 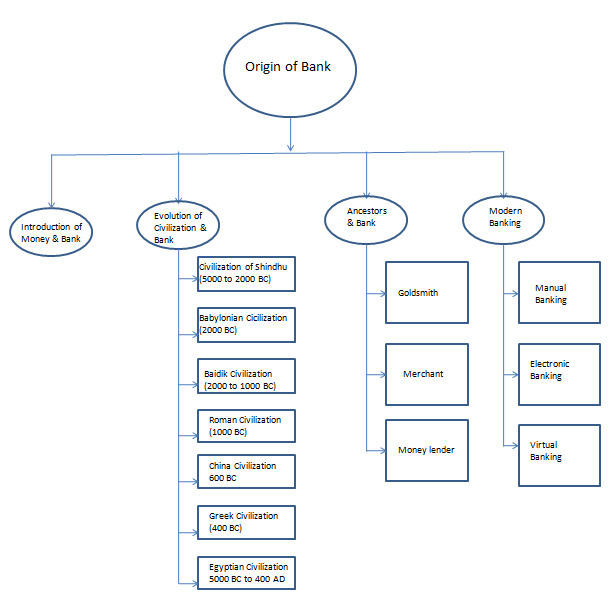 The organization which is engaged into money transaction, is called bank. F.E. Perry -- " Bank is establishment which deals in money, receiving it on deposit." Peter Rose -- "Bank is a financial inter intermediary accepting deposits & granting loans." The Oxford English Dictionary -- "Bank is the shop, office or place of business of money dealer." R.S. Sayers-- "Banks are institutions whose debts are commonly accepted in final settlement of other peoples debts." Prof. Chambers -- "A bank is an office or institution for keeping, lending & exchanging etc. of money." At last it is said any financial institutions which concerns to collect or deposit money and transactions , give loans , investment through various system for gaining profit, are known as bank. is the business of banker (any person carrying on the business of banking), the keeping or management of a bank. More over banking is combination and accumulation of all the activities performed effectively & efficiently by the banker. Thank you for this clear image of bank and is very important matter also thank you for sharing this post. If you want essay related topic you can take online essay writing service help through custom essay writing service before the exam. Avail the best online Architecture Assignment Help in USA with the help of our online tutors.